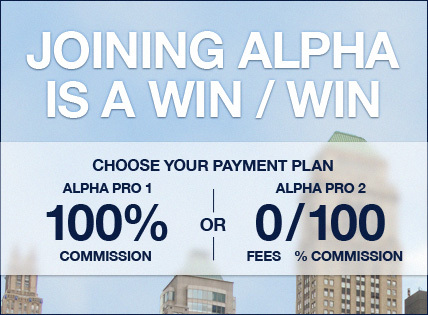 Alpha Pro 1 - Low membership charge of $499 and a low fixed transaction charge of $200 per rental & $2000 per sale. Alpha Pro 2 - Up to 100K gross split of 70% for ANY deal. Once you reach $100K in gross commissions, YOU KEEP 100% OF ALL YOUR EARNINGS! No membership fee, No transaction fee No surprises. Over 140 EXCLUSIVE BUILDINGS to work on. Yes, our listings only! Alpha has a place for every type of agent, and wants to work with you! NEW AGENTS: Our unique training model has proven to be an excellent for new agents. It's designed to start you making money quickly, and more importantly, to ensure you continuous growth in your career. SENIOR AGENTS: Our structure has excelled at driving entrepreneurial agents to new heights in their business and resulted in their literally doubling their income! In addition, Alpha Properties offers a stimulating, enlightening Sales Workshop to make sure that all our agents are capitalizing on their potential and increasing their income from sales. Prosper & Grow...Contact Us Today! For additional information or to schedule an interview with Sunny, feel free to call 212.674.1645, or email him at [email protected]. Once you decide to join us, our office managers will make sure you are up and running that same day! So what are you waiting for? Success is just a phone call away!